Gabrielle Meyer lives in central Minnesota on the banks of the Mississippi River with her husband and four young children. As an employee of the Minnesota Historical Society, she fell in love with the rich history of her state and enjoys writing fictional stories inspired by real people and events. She can be found on her personal blog at www.gabriellemeyer.com, or her group blog, www.coffeecupsandcamisoles.blogspot.com, where she writes about her passion for history, Minnesota, and her faith. We’d love your help. Let us know what’s wrong with this preview of Keto for Life by Mellissa Sevigny. We’d love your help. Let us know what’s wrong with this preview of The Secrets of Paper and Ink by Lindsay Harrel. 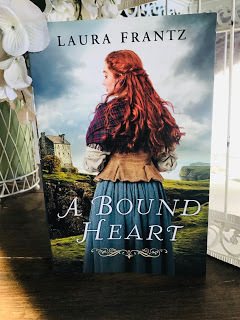 Filled with all the things we love about Laura’s writing, breathtaking prose, heart-pounding romance, and an epic journey, A Bound Heart is a unique story with equally unique settings. I’ve never read another story like this one. From the beautiful S Filled with all the things we love about Laura’s writing, breathtaking prose, heart-pounding romance, and an epic journey, A Bound Heart is a unique story with equally unique settings. I’ve never read another story like this one. From the beautiful Scottish Island of Lark and Magnus’s upbringing, to the new colonies in America and Jamaica, this story spans the globe, yet keeps two hearts bound as one. I especially loved the characters in this story, both main and secondary. Each one is unique and realistic. From the colorful inhabitants of the Scottish island, smuggling goods to stay alive, to the desperate characters onboard the ship, indentured for their crimes, to those in the slave quarters in both America and Jamaica, fighting to stay alive, and the Gentry in Williamsburg, building a new society, there is so much to love about this story. I enjoyed each and every page and didn’t want the tale to end. We’d love your help. Let us know what’s wrong with this preview of A Bound Heart by Laura Frantz. We’d love your help. Let us know what’s wrong with this preview of A Moonbow Night by Laura Frantz. A couple months ago, I found myself sooooo impatient for Laura Frantz's next book that I went back and read basically every other book of hers. Which was wonderful...but it only made me more impatient! “Do you girls have hope chests?' Lloyd asked. Hi, Gabrielle. Great to make contact on GR! How are we not already friends, here??? Thanks Gabrielle!